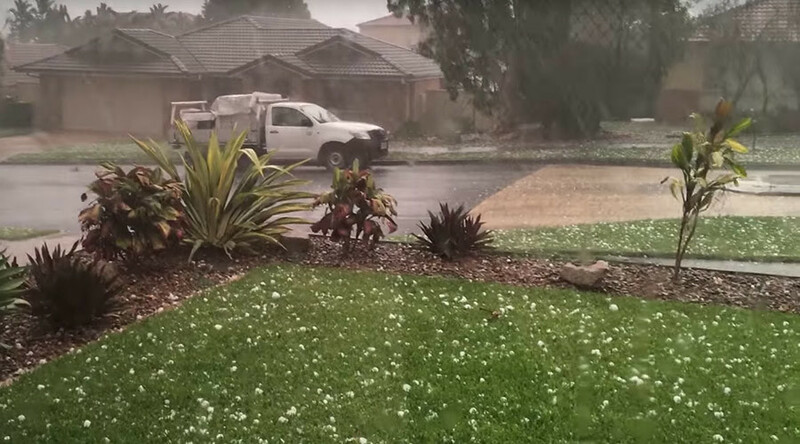 A strong storm swept through Brisbane, Australia on Saturday, pummeling it with hail the size of tennis balls and prompting a barrage of posts on social media. After some sun and heat, the Bureau of Meteorology warned that severe thunderstorms could hit Brisbane and nearby towns, urging local residents to move cars under cover and away from trees. “Residents should bring loose outdoor items indoors and secure items, which can’t be moved, such as swing sets and trampolines,” it also recommended. More than a thousand buildings were left without power in the nearby region of Somerset after a storm went through the area. Large hailstones, damaging winds, and heavy rainfall likely to cause flooding were forecast. A severe weather warning is still in place in some areas of Brisbane. “When we talk about severe, we are looking at hail greater than 2 cm in diameter, winds greater than 90 kilometers per hour, or rainfall conducive to flash flooding,” Jess Carey, a spokeswoman for the Bureau of Meteorology, said. Australia has a long history of dangerous storms, especially in the period from November to February traditionally regarded as the “season of storms,” when they are nothing out of the ordinary. The storm, however, also had a silver lining, as lots of people hiding at home or under shelters had a chance to update their friends’ newsfeed with blood-chilling photos and videos.